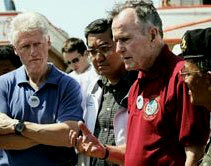 Former U.S. Presidents Bill Clinton and George Bush, Sr., are visiting countries that were affected by the Asian tsunami. Current U.S. President George W. Bush asked them to lead a U.S. effort to help raise aid for those affected by the tsunami. The former presidents arrived at Phuket, Thailand, on February 19th, and then traveled to Ban Nam Khem, Thailand. They will also visit Indonesia, Sri Lanka, and the Maldives. Clinton and Bush have been deeply moved by the people they have met and the devastation that they have seen. "I don't think there's ever been a tragedy that affected the heartbeat of the American people as much as this tsunami has done," said George Bush, Sr. "I don't think you can put a limit on it. It's so devastating. They're still finding wreckage; still actually some bodies being recovered." After seeing the devastation, Clinton expressed his concern that the press coverage remain high to keep the tragedy on people’s minds. "We don't want to let it go too far from the headlines so that people forget about it,” he said.